An insane criminal from the dimension of Infinita, Kronis was one of several evil warriors freed from an intergalactic prison by Keldor to bolster his ranks during the start of the Great Unrest. After serving Keldor for years, Kronis grew ambitious and raised an army of his own to challenge his master. 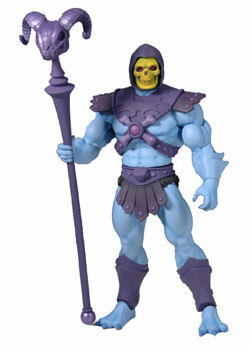 Now a powerful Overlord of Evil, Skeletor defeated Kronis — breaking his jaw and arm, and leaving him for dead. Found and rebuilt by Tri-Klops, Kronis was transformed by him into Trap Jaw, a man armed with combat weapons and an “iron jaw! Combat: Trap Jaw is a deranged an vicious opponent. Claw: If his claw inflicts damage the target cannot move until they pass a Level 6 Might test. Las Gun: Inflicts 6 damage. 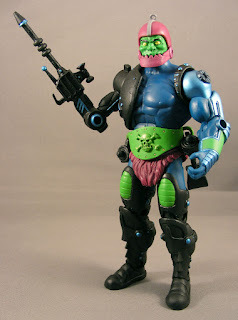 Use: Trap Jaw has begun a terror spree in the town the characters are staying in. Loot: A defeated Trap Jaw yields 2 cyphers.